Do you have a child who loves to doodle every now and then? If you do, there’s a possibility you may have dissuaded him or her from doing so, as you think that doodling is nothing more than “spacing out”. Doodling, as far as many parents are concerned, distracts from the studying and listening in class that they have to do. However, if an article written by Cathy Malchiodi for Psychology Today is to be believed, doodling isn’t so bad at all. Citing Sunni Brown, author of The Doodle Revolution: Unlock the Power to Think Differently, Malchiodi states that doodling may have gotten a bad rap. Speaking at TED Talks, Brown says that doodling is deep thinking in disguise. She even goes on to say that doodling actually helps you think and solve problems in general. 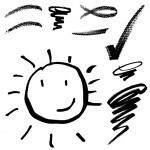 The article also cites research that reveals doodling is helpful in memory retention. As one experiment goes, the doodlers performed better in memory retention than those who didn’t draw anything while performing the test. So the next time you catch your child doodling, perhaps you shouldn’t be too harsh to judge it as wasting time. I mean, you may have probably doodled as a child yourself, but you may have done well for yourself just the same. For all we know, you still doodle when stuck in a long meeting or when listening to a boring lecturer or speaker. I know I do. This entry was posted on Friday, January 17th, 2014 at 9:09 am	and is filed under Commentary. You can follow any responses to this entry through the RSS 2.0 feed. You can skip to the end and leave a response. Pinging is currently not allowed.